​Why is Maryland treating Washington County for Black Flies? Bacillus thuringiensis israelensis (Bti)​​ will be applied by helicopter. While the schedule is subject to change, our preliminary scheduling is for five, monthly applications beginning August 2017. Bti is a naturally occurring soil bacterium that has been demonstrated to be non-toxic to humans, mammals, birds, fish and most invertebrates. Maryland’s program is modeled heavily on Pennsylvania’s program, which has been in effect since the 1980s. The insecticide that will be used for this project is Vectobac 12 AS. The active ingredient is Bti. While black flies are small (2-5 mm length), they can have a big impact on outdoor activities. 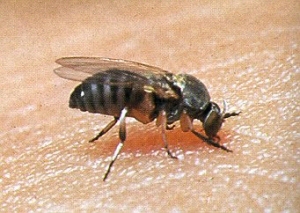 Some black flies (Diptera: Simuliidae) can impact outdoor recreation and tourism cause serious by their persistent biting and swarming behavior. The black fly life cycle has four stages: egg, larva, pupa, and adult. All are aquatic except the adults, which leave the water to search for food and mates. Larval growth is very temperature dependent, with relatively slow growth during the cold winter months and very rapid growth during warm summer water temperatures. Avoid areas of high black fly infestation. Avoid unnecessary outdoor activities at dawn and dusk when black flies are most active. Wear light-colored clothing because black flies are attracted to dark colors. Use black fly repellents containing DEET. Consult a physician before applying DEET to young children. Restrict the outdoor play of your children if black flies are present.